Lois Winston, she who writes about me, recently took some time off from putting my life in jeopardy and went on vacation. While away, she had the chance to make a dent in her to-be-read pile, catching up on some reading. One book in particular impacted her tremendously because it practically took place in her backyard—even if she never knew about it until decades later. It’s hard to imagine in today’s world of 24/7 news cycles, social media, and the Internet, that there was a time not that long ago when we didn’t worry about the horrors of terrorism and school shootings. But people had other worries, and those worries—of A-bombs and communists and airplanes falling out of the sky—were just as real and just as terrifying to people in the mid-twentieth century. 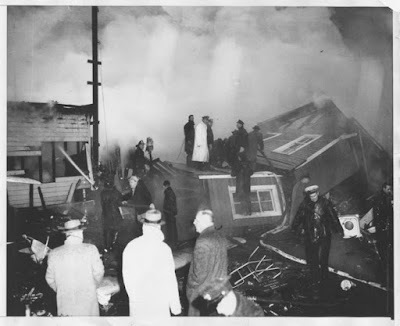 This is the backdrop of In the Unlikely Event, a fictionalized account of a triple disaster that took place in Elizabeth, NJ over the course of less than two months in late 1951 and early 1952 when three commercial airliners crashed into the city. Lois grew up very close to the site of these crashes. Yet, she never knew about them until reading a review of In the Unlikely Event. Strange as it may seem, adults just didn’t speak of such things around children back then. And that’s part of the theme of this book. How do we deal with the aftermath of horror if no one wants to talk about it? Nowadays we encourage our children to talk about their feelings. Back then, adults swept anything unpleasant under the rug and pretended everything was all right. Yet it rarely was. 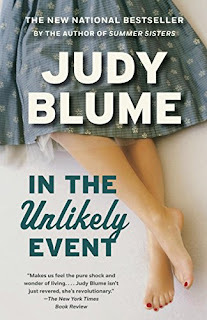 Judy Blume, the book’s author (yes, THAT Judy Blume!) was a young teenager in Elizabeth at the time of the crashes, and as such, infuses her book with a realism that only someone with a firsthand experience of the events could accomplish. Told from the points of view of a fifteen-year-old girl, three generations of her family, and various friends, acquaintances, and strangers, the book explores how this triple tragedy impacted each character personally and in relation to those around them. Like you I was from an area near Elizabeth and the crashes happened just before I was born. And also never heard anything about it. Not even in whispers among flight crews. It is quite strange, isn't it, Helen? Thanks for stopping by.